So, a couple months ago I went Hawaii and I tasted so many yummy delicious food there! I’m still hungry for all the foods in Hawaii!!! The other day I was craving Marukame Udon in Hawaii. 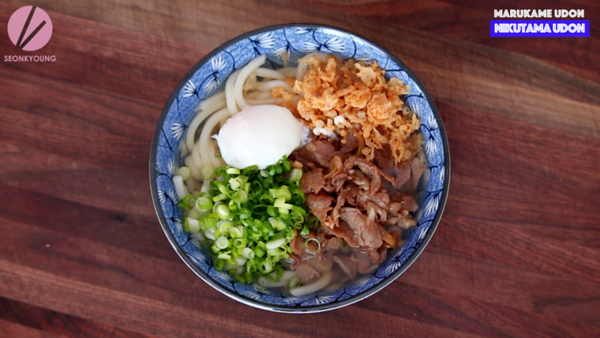 Ah, the fresh udon noodles with sweet beef, soft egg, crispy tempura flakes and sharp green onion… Beef Udon perfection!! I had to recreate Beef Udon- Nikutama Udon at home, other wise I will be spending $500 to taste a bowl of udon noodles every time when I crave it. So, I made this recipe as a “Cheating” version, which is using lots of short cut. Hey, we all are busy, let’s not judge. Onsen means hot spring and tamago means egg in Japanese. So it means hot spring egg. You know there are lots of hot spring in Japan and they just found another use of it other than monkeys taking bath and drinking sake in. They tried cooking eggs in the hot spring and it turned out just perfect if it’s not better than poached egg. Also, it’s easier than poached egg! 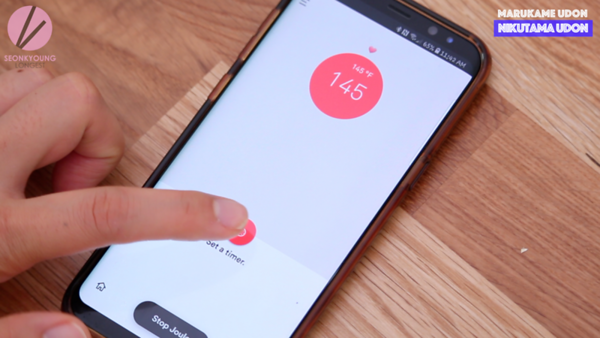 All you have to do is drop the egg into 145°F water for 1 hour. Then just crack the egg into the serving plate! I’m so fancy recently so I decided to purchase a sous vide from Amazon. So far I cooked eggs and 1 pork belly in my sous vide but that’s ok. I will cook steak one day as every other fancy chefs doing. This is my sous vide, Joule, so awesome. If you don’t wanna use sous vide, check out below recipe. I made onsen tamago without the sous vide. Carefully add eggs and cook the eggs for 1 hour. 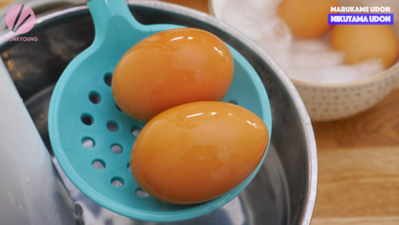 Remove the eggs from the water and place in a ice water bath to stop cooking. As I mentioned, you can buy tempura flakes from Japanese grocery or online. But if you feel fancy and wanna make tempura flakes from scratch, heat frying oil 375°F. 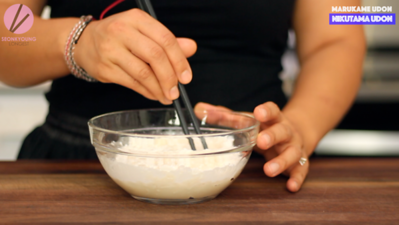 Combine tempura powder and water in a mixing bowl. So there is 2 ways to do the tempura flakes, one is a bit intimidating, because you pretty much have to dip your hand into tempura batter to hot oil. But this will give you the perfect result of traditional style tempura flakes. 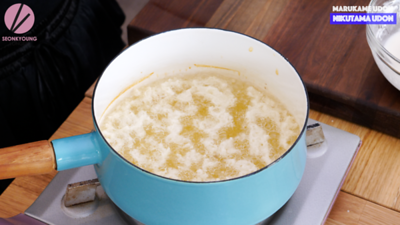 Carefully add 2 to 3 tablespoons tempura batter (at a time ) into hot oil with circling action. Fry tempura batter for 1 minute or until golden brown crispy. Remove with a strainer and place on a paper towel lined tray. Repeat with the remaining batter. Please do not fry the batter too much at a time, the hot oil will boil over. 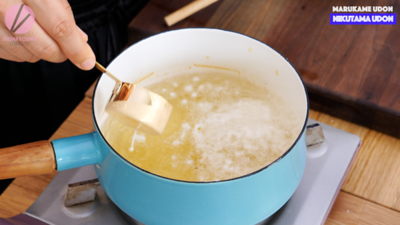 Also, make sure to use large enough pot, because as soon as the batter gets into the hot oil, the bubbles extend the size. Big time. Be careful. Breakdown the tempura flakes to your desire size. Jacob likes it big, I like it medium. Egg and the tempura flakes can be 5 to 7 days made ahead. Of course, keep the egg in the refrigerator and keep the tempura flakes in a air tight container in your pantry. 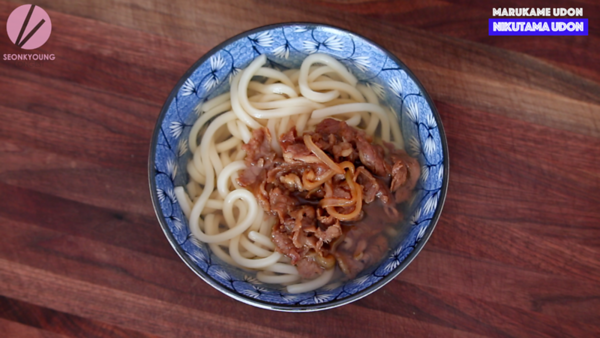 Finally, let’s make the beef udon! 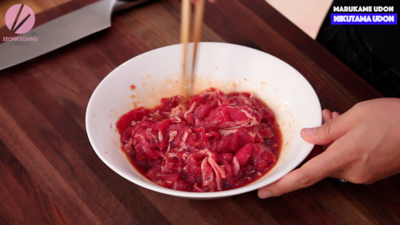 Combine the beef, soy sauce, sugar, mirin and sake in a bowl. 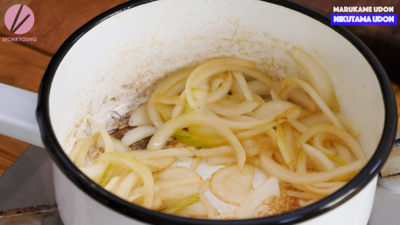 Heat a pan or medium size pot over medium heat then add oil and sliced onions. Sauté the onion until translucent, about 2 to 3 minutes. Add beef mixture and cook the beef until beef is about half way done, about 2 to 3 minutes. 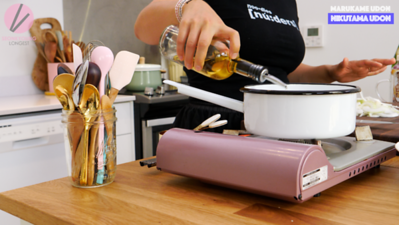 Pour dashi stock and let it simmer for 4 to 6 minutes or until beef is fully cooked and onion is soften. 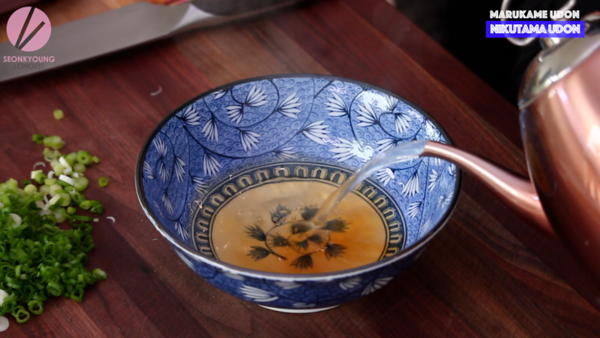 Dashi is Japanese cuisine’s basic ingredients, more than half of Japanese food/recipe calls dashi. It’s their heart of cooking. 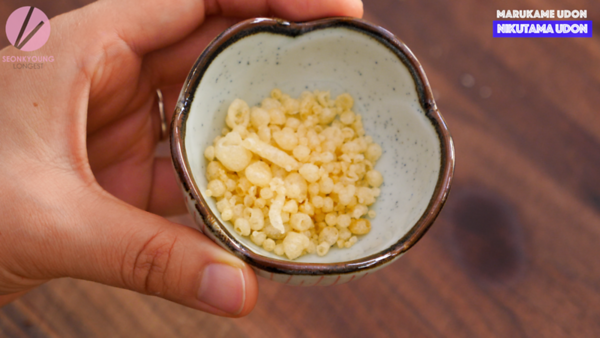 Check out my basic dashi recipe below if you wanna make it from scratch. Well, since this is a “Cheating” recipe, I used hondashi powder incased of making form scratch. 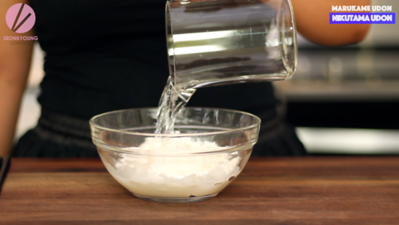 Just add this hondashi powder into water and ta-da~! Instatnt dashi stock is ready to go! It’s like chicken bouillon, Japanese version of it! It tastes really good. I love using this hondashi powder for shortcut! 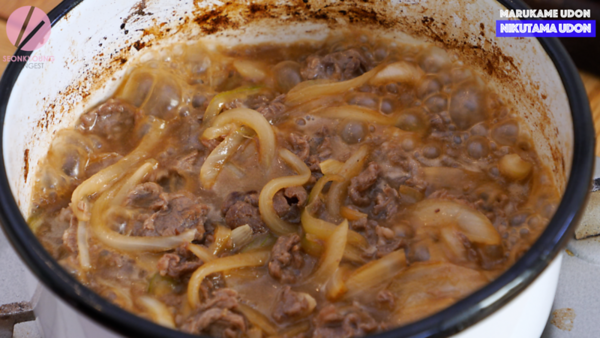 When the beef is fully cooked and onion is soften, remove from heat and set aside. 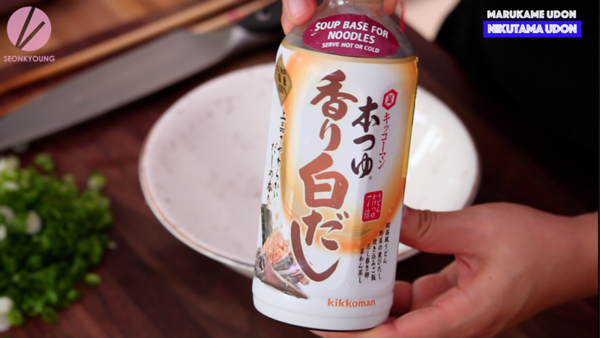 Cook the udon noodles by following the directions of the package you are using. 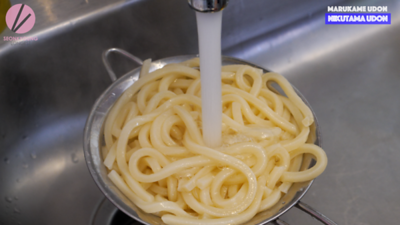 Rinse the noodles under running cold water then hot water for last 10 seconds. Also boil 4 cups water for the soup. This is my favorite udon noodles, you can find at Japanese/Asian grocery frozen section! In a serving bowl, place tsuyu- Japanes soup base and 2 cups boiling water. Tsuyu is great short cut for Japanese hot/cold sup recipes! Depending on the brand or type of tsuyu, the ratio can be different so please check and follow the direction of the tsuyu bottle you are suing. Mine was 1 part tsuyu to 6 parts water. 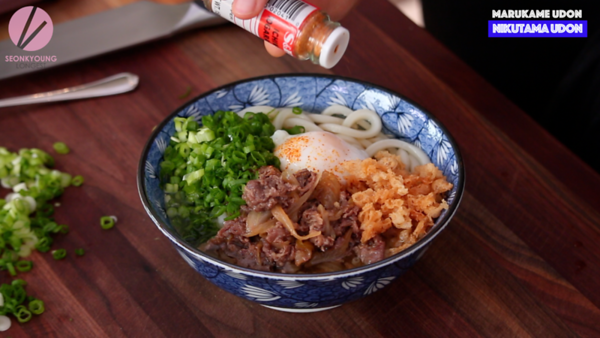 Add the udon noodles, then top with the sweet beef, the tempura flakes, green onions and lastly the egg. Just simply crack the egg right top of the udon. Sprinkle some shichimi- Japanese 7 spices if you like to and enjoy! Prepare sous vide 145°F Carefully add eggs and cook the eggs for 1 hour. 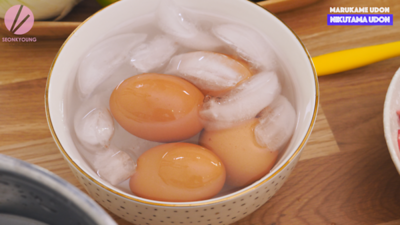 Remove the eggs from the water and place in a ice water bath to stop cooking. If you want to make the soft egg without sous vide, please check out my “Kimchi Fried Rice with Beef Short Ribs” recipe! You can also use simple poached egg or soft boiled egg. You can buy tempura flakes from Japanese grocery or online. 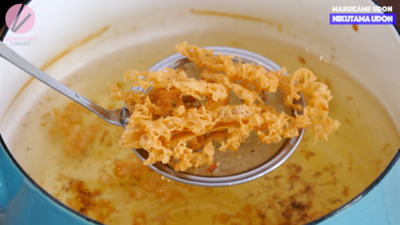 But if you are making tempura flakes from scratch, heat frying oil 375°F. 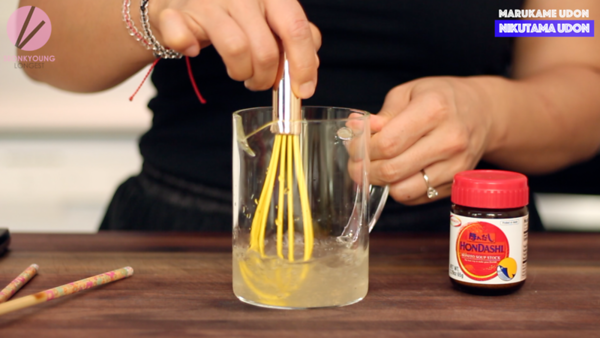 Combine tempura powder and water in a mixing bowl. 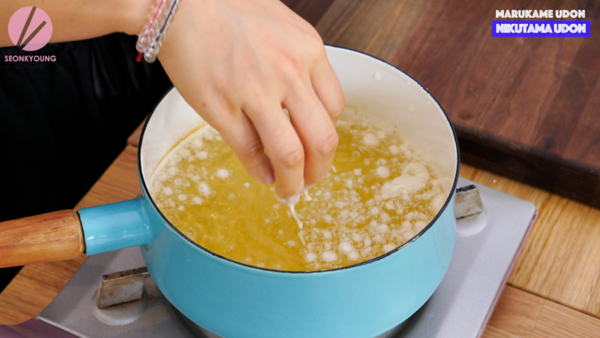 Carefully add 2 to 3 tablespoons tempura batter (at a time ) into hot oil with circling action. Fry tempura batter for 1 minute or until golden brown crispy. Remove with a strainer and place on a paper towel lined tray. Repeat with the remaining batter. Please do not fry the batter too much at a time, the hot oil will boil over. 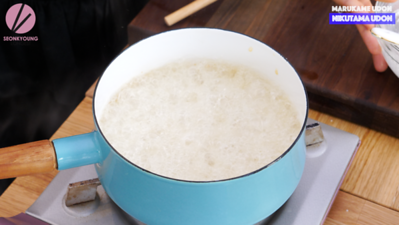 Also, make sure to use large enough pot, because as soon as the batter gets into the hot oil, the bubbles extend the size. Big time. Be careful. 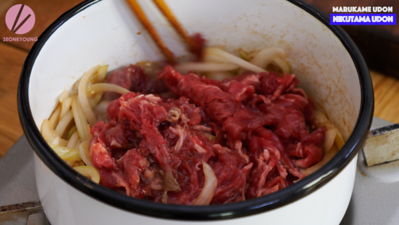 Let’s make the beef udon! 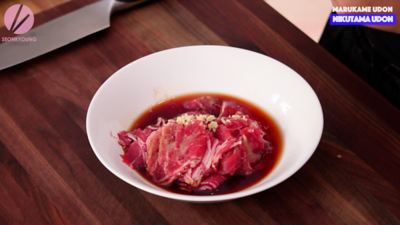 Combine the beef, soy sauce, sugar, mirin and sake in a bowl. Heat a pan or medium size pot over medium heat then add oil and sliced onions. Sauté the onion until translucent, about 2 to 3 minutes. Add beef mixture and cook the beef until beef is about half way done, about 2 to 3 minutes. 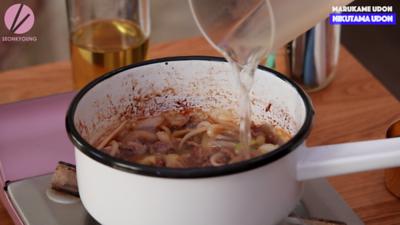 Pour dashi and let it simmer for 4 to 6 minutes or until beef is fully cooked and onion is soften. Remove from heat and set aside. 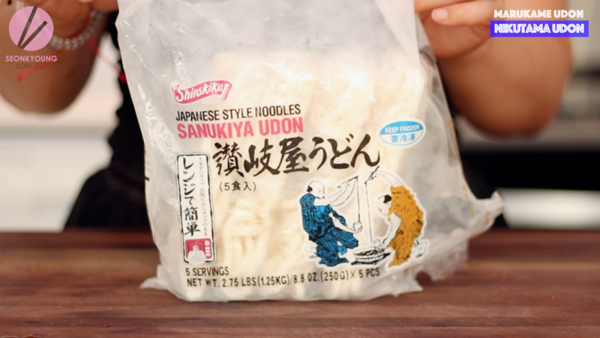 Cook the udon noodles by following the directions of the package you are using. 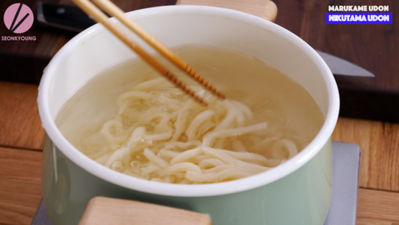 Rinse the noodles under running cold water then hot water for last 10 seconds. Also boil 4 cups water for the soup. In a serving bowl, place tsuyu- Japanes soup base and 2 cups boiling water. Depending on the brand or type of tsuyu, the ratio can be different so please check and follow the direction of the tsuyu bottle you are suing. Mine was 1 part tsuyu to 6 parts water. 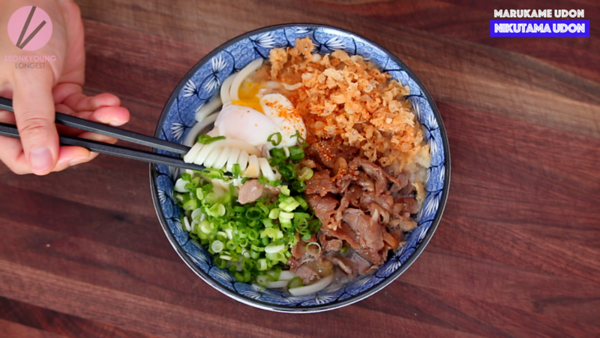 Add the udon noodles, then top with the sweet beef, the tempura flakes, green onions and lastly the egg. Just simply crack the egg right top of the udon. 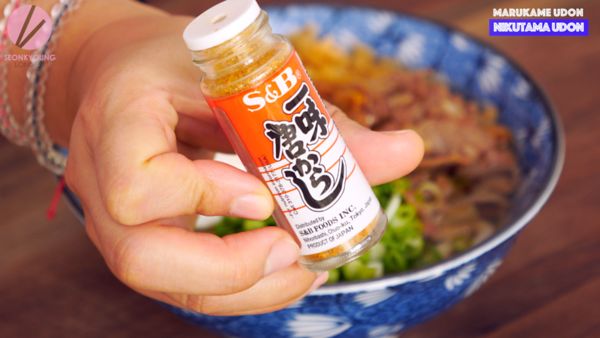 Sprinkle some shichimi if you like to and enjoy!